The enhanced power of the new measuring technique to characterize materials at scales much smaller than any current technologies will accelerate the discovery and investigation of 2-D, micro- and nanoscale materials. Being able to accurately measure semiconductor properties of materials in small volumes helps engineers determine the range of applications for which these materials may be suitable in the future, particularly as the size of electronic and optical devices continues to shrink. The team's design approach was focused on developing the capability to provide quantitative feedback on material quality, with particular applications for the development and manufacturing of optoelectronic devices. The method demonstrated is capable of measuring many of the materials that engineers believe will one day be ubiquitous to next-generation optoelectronic devices. Optoelectronics is the study and application of electronic devices that can source, detect and control light. Optoelectronic devices that detect light, known as photodetectors, use materials that generate electrical signals from light. Photodetectors are found in smartphone cameras, solar cells and in the fiber optic communication systems that make up our broadband networks. In an optoelectronic material, the amount of time that the electrons remain "photoexcited," or capable of producing an electrical signal, is a reliable indicator of the potential quality of that material for photodetection applications. The current method used for measuring the carrier dynamics, or lifetimes, of photoexcited electrons is costly and complex and only measures large-scale material samples with limited accuracy. 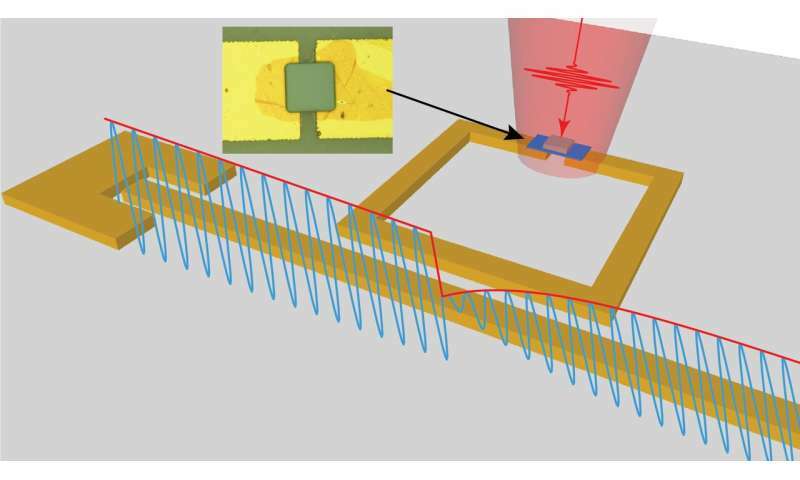 The UT team decided to try using a different method for quantifying these lifetimes by placing small volumes of the materials in specially designed microwave resonator circuits. Samples are exposed to concentrated microwave fields while inside the resonator. When the sample is hit with light, the microwave circuit signal changes, and the change in the circuit can be read out on a standard oscilloscope. The decay of the microwave signal indicates the lifetimes of photoexcited charge carriers in small volumes of the material placed in the circuit. "Despite the importance of carrier lifetime, there are not many, if any, contact-free options for characterizing small-area materials such as infrared pixels or 2-D materials, which have gained popularity and technological importance in recent years," Wasserman said. High-speed detectors operating at these frequencies could even enable the development of free-space communication in the long wavelength infrared—a technology allowing for wireless communication in difficult conditions, in space or between buildings in urban environments.